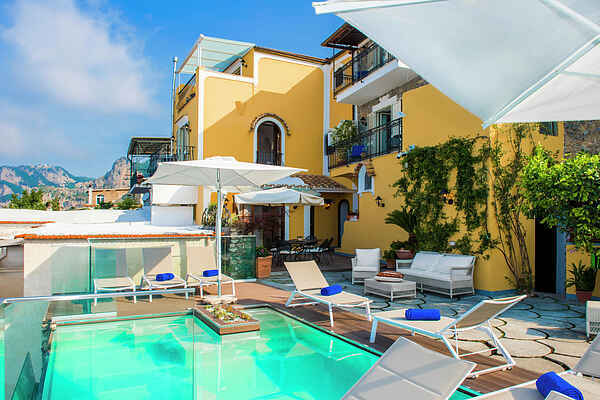 If you are looking for a panoramic villa in Positano, furnished with great taste, and able to let you enjoy the beauty of the Amalfi Coast, choose Villa Sky Meets Sea. This villa is very special and will make your stay unforgettable. You can see the entire Amalfi coast. Be seduced by the beauty of the crystal clear sea and the untouched nature, rich in strong smells. Upon arrival you will see the beautiful infinity swimming pool and a large solarium with tables and sunbeds. The swimming pool is heated from October to April and is open all year. The comfortable and romantic furniture of the villa and the jacuzzi give you the feeling that you are being pampered. All rooms are cleaned daily and the linen is changed regularly. There is a fully equipped kitchen, air conditioning, heating, satellite smart TV, an infinitive swimming pool with sun beds and free WiFi. Villa Sky Meets Sea is an exclusive villa in Positano, ideal for enjoying the beauty of the Amalfi coast in a quiet and relaxing location. From here you also have access to the beautiful "Sentiero degli Dei" (path of the gods), a footpath of 11 km that allows you to admire a unique panorama. Positano is a chic and picturesque resort with Moorish-style architecture and steep slopes with houses. By boat you can reach Capri, Ischia and the cave Grotta dello Smeraldo. The city is known worldwide for its beauty and romance. It is also possible to request additional services to make your holiday even better. The staff will be happy to help you arrange all your transfers to and from the villa and with excursions by land or sea. It is also possible to arrange a professional babysitter. Upon request, you can receive a personal chef in the villa.